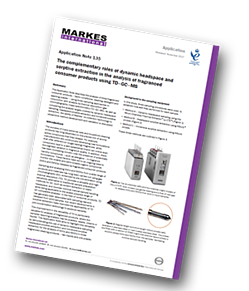 Markes International has produced an application note describing the analysis of three fragranced consumer products – fabric conditioner, washing detergent and washing powder – using three sampling approaches in conjunction with analysis by thermal desorption–gas chromatography–mass spectrometry (TD–GC–MS). As well as comparing the analyte ranges covered by dynamic headspace sampling, headspace sorptive extraction and immersive sorptive extraction, the ability of Markes’ re-collection technology to streamline method development and validation is discussed. The success of many personal care and household cleaning products has long depended on the precise mix of aroma-active compounds that they release. For example, manufacturers are continuously developing new formulations that offer different (or longer-lasting) fragrances, while consumers loyal to a well-established brand can notice even the slightest variation in fragrance quality. In addition, there has been increasing concern over the presence of potentially harmful compounds – such as allergens – in fragrance formulations. These factors have led to an ongoing need to monitor the volatile and semi-volatile organic compounds (VOCs and SVOCs) released by fragranced consumer products. Thermal desorption (TD) provides a versatile and high-sensitivity alternative to traditional sample preparation methods for GC, such as solvent extraction or static headspace, and involves minimal manual sample handling while being applicable to the widest possible range of GC-compatible analytes. This application note aims to highlight this versatility by demonstrating the use of dynamic headspace sampling, headspace sorptive extraction and immersive sorptive extraction for the analysis of VOCs and SVOCs in three fragranced cleaning products – two liquids and one powder. Method C – Immersive sorptive extraction using HiSorb™ probes. All three sampling approaches described above involve analysis by thermal desorption (TD). This is a versatile GC pre-concentration technology that is used to analyse VOCs and SVOCs in a wide range of sample types. By concentrating organic vapours from a sample into a very small volume of carrier gas, TD maximises sensitivity for trace-level target compounds, helps to minimise interferences, and routinely allows analyte detection at the ppb level or below. It also greatly improves sample throughput, by combining sample preparation, desorption/extraction, pre-concentration and GC injection. In this study, we have shown that either dynamic headspace sampling, headspace sorptive extraction or immersive sorptive extraction can be used in conjunction with TD–GC–MS analysis to provide valuable information on the volatile profiles of fragranced consumer products.